Good food and friendly service – it’s what keeps guests coming back to The Heidelberg Restaurant, Tavern & Motel. 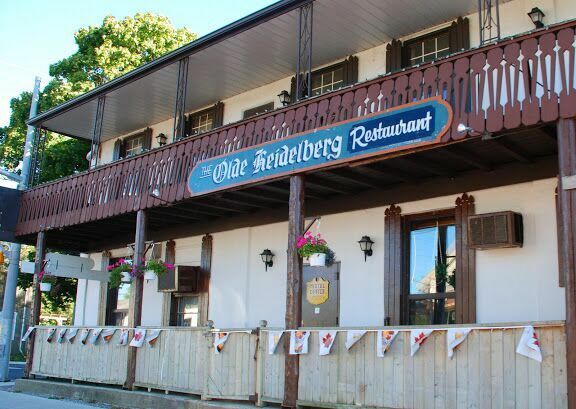 Located in the town of Heidelberg in the heart of Mennonite country, the building that is now The Heidelberg Restaurant, Tavern & Motel was built in 1860 by Heinrich Adam Müller (also known as Henry Miller). Originally a stagecoach stop, guests from all over now come to the restaurant to enjoy its Pennsylvania Deutsch (German) and Canadian menu. It is located just minutes away from Waterloo, St. Jacobs, and several local attractions including the St. Jacobs Farmers’ Market. Guests to the restaurant can expect two servers to arrive at their table: one who will immediately take drink orders, and another who will take food orders. Service is quick and efficient, with a friendly small town feel. The generous food portions satisfy even the hungriest guest, while guests with smaller appetites can order half-size portions of many of the entrées. Favourite menu items include ribs, pigtails, sausages, schnitzel, sauerkraut, and perhaps the Heidelberg’s best known entrée – smoked pork hocks. A popular destination for large groups, be sure to book ahead for family events, weddings, tour groups and birthday parties. The Tavern offers a wide variety of draft and bottled beer, coolers and mixed drinks. Its lighter pub-style menu includes soups, salads, sandwiches, battered mushrooms, garlic bread, chicken fingers, and more. With eight TVs including a big screen TV, the tavern is a popular place to enjoy sporting events with friends. In the summer, enjoy a drink and a meal on the outdoor patio and watch the quiet pace of rural life pass you by. Get a good night sleep at The Heidelberg Motel. Every room has two double beds, air-conditioning with individual climate control, and cable television. Pets are allowed in select rooms. The Holiday Inn Kitchener - Waterloo Hotel & Conference Centre is located just minutes away from Highway 401 and Highway 8, and is a short drive from Waterloo Region’s technology and innovation corridor.